Infinix may be planning something bigger to add to their already popular range of Android smartphones as a leaked picture online shows an Infinix Smartphone with a sensor and something that looks like a full metallic cover. 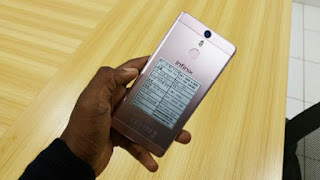 This leaked picture was spotted on Nairaland and if this happens to come out very soon, we may be seeing this particular Infinix Smartphone in competition with major brands like Samsung Galaxy series and HTC Android phones, that is material wise though. Before now, infinix has launched many Android smartphones which includes the Zero, HOT and the HOT Note Series and you will agree with me that they've all being doing well in mobile world. Apart from the fact that their recent Android products has been a little bit on the high side, Infinix came in to the market when most Nigerians wanted certain level of quality for less and I can definitely say that Infinix played a major role in filing that gap alongside Tecno and other china phones that didn't compromise on quality. Let's keep our fingers crossed as we await more information about this unknown Infinix Android phone.